Wolfgang Amadeus Mozart was a composer of classical music. He was born in Salzburg, at that time a Germanic city in the Holy Roman Empire, now in Austria, on January 27, 1756. He died in Vienna, Austria in 1791 (aged 35). He married Constance Weber. They had two sons. He was a child prodigy. As a boy, he traveled in Europe with his parents and sister. He and his sister played concerts in Paris, London, and many other places. When he was a man, he moved to Vienna. He wrote for the violin, the harpsichord, the organ and the pianoforte. He conducted and performed in public on the piano and taught music. He was one of the greatest masters who excelled in all the musical genres of his time: the concerto, the symphony, the sonata, and also opera. His best known works were written during his years in Vienna. These works include four operas: The Marriage of Figaro, Don Giovanni, Così fan tutte, and The Magic Flute. He also wrote the "Jupiter" Symphony No. 41 in C major; the Requiem in D minor; and many string quartets, concertos, sonatas for the piano, and serenades for small orchestras. He left an important body of work, comprising 626 pieces listed in the Köchel catalogue. Mozart was the son of Leopold Mozart and Anna Maria Perlt. His older sister Maria Anna, nicknamed Nannerl, was four and a half years older than him. 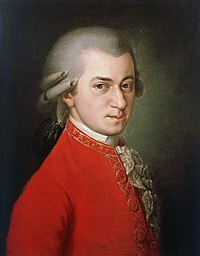 When Mozart was born, his father Leopold was 37 years old. He came from a family of book binders, but chose the career of a musician. He wrote pleasant music and became the deputy-master of the chapel. He also became famous thanks to a method or course book for the violin. In 1747, Leopold married Anna Maria Pertl, the daughter of a government official. Her father was a singer and choir leader. There were seven children, of which only two reached adult age: Wolfgang and Nannerl. From the age of three, Mozart revealed prodigious gifts for music. He was very advanced compared to other children his age. His father was conscious of this, and pushed him to work. His sister Nannerl started the harpsichord at the age of eight, and he listened to her. Brought up with music, Mozart progressed very quickly: at 6 years old, he wrote his first works, even though he did not yet know how to read! He also mastered the violin and the harpsichord, which, for such a young boy, was a real accomplishment. To bring recognition to his son, Leopold decided to set off on a journey. Wolfgang and his sister were welcomed by the imperial court: it was a genuine success. The crowd cheered the young Mozart and asked him to do demonstrations, for example, playing the harpsichord with a sheet hiding the keyboard. The two musicians put together concerts, receptions and invitations at a rapid pace. Two weeks after their arrival, the young Mozart fell ill and had to stay in bed. Recovering very quickly, he continued his trip and finished by returning home. During the years to come, they set off on many other trips longer or shorter, in search of glory and riches. In particular, they visited France and Italy, which Wolfgang very much enjoyed. Portrait of Mozart, age 14. by Saverio dalla Rosa, in Verona, January 1770. At age 11, Wolfgang was no longer a child prodigy, just an exceptionally gifted musician. He received many commissions for works that he had to compose. The whole family went on tour again, but the welcome was less warm and they returned home disappointed. Returning to Salzburg, Wolfgang became konzertmeister, master of concerts; he was 14 years old! Though he continued to work with furious energy, listening to fashionable operas, playing, composing... The Padre Martini, aged 64 years, imposed long exercises on him in order to complete his training. At 15, Wolfgang became a member of the city's Philharmonic Academy, although he had not reached the age of entry, set at 20 years! Wolfgang grew up and soon felt cramped for space between the walls of the city. He was restricted by his job as a concert master, which obligated him to compose but also to play in the orchestra. He wants to make himself known. Finally, an opportunity arose to flee from Salzburg: the master of the Vienna chapel was gravely ill. The Mozart family thus returned to Vienna and paid a visit to Empress Maria Theresa. But she denied them the coveted post. Despite this, Mozart amused himself in Vienna; he was reunited with acquaintances and wrote numerous pieces. Aged 18, Wolfgang creates numerous pieces: Thamos, King of Egypt and the symphonies nos. 25 and 28. His style changed, he created his own musical style and left his mark on the history of music. A new journey began, but this time, nobody wanted to listen to Wolfgang. Everywhere, he hit a wall of hostility and indifference. Anna Maria, his mother, was weak and sick. Contracting a fever, she died in 1778. Wolfgang was very affected by the loss of his mother. On the order of his father, he leaved Paris and returned to Salzburg going back to his work of master of concerts. In 1779, at the age of 23, he became the organist for the Archbishop of Salzburg. Wolfgang had to supply work on demand, which was far from pleasing for him. Bored, he loses the taste for composing. Then came a significant command, Idomeneo, which finally cut away the daily monotony by occupying Mozart. It´s a success; Wolfgang is happy. During this time, his boss orders new works and asks him to go back to work. The two men clash and Wolfgang is dismissed to his great pleasure. Mozart did not have anymore work, he is still in Vienna, but he is poor. However, he succeeded in achieving his dream: to write a German opera, 'The Abduction from the Seraglio'. Gossip is rife about the affection between the young Wolfgang and the young Constance Weber. To cut it short, Mozart and Constance become engaged. During this time, 'The Abduction from the Seraglio' appears and enjoys a dazzling success. On the August 4, 1782, Wolfgang is married at St. Stephen's Cathedral in Vienna. Mozart's works permitted the couple to live comfortably. They were expecting their first child, Raimund. German opera does not working anymore. Undaunted, Wolfgang goes on to Italian opera. During a voyage to Salzburg, they leave their child in Vienna. He dies during their absence. But Mozart remains confident about the future. For several years, Mozart produced a lot and was still rather pleased. He wrote, The Marriage of Figaro, a success. His father is moved by his work and visits him. Then public attention wanes. Mozart is misunderstood and unhappy, his third child is dead. In total, he and Constance have six children in nine years. Only two of them, Karl Thomas and Franz Xaver Wolfgang, reach adulthood. Wolfgang returned to Prague where he was celebrated and acclaimed. But very quickly comes a dark period . His friends are gone, and he loses a loved one. To overcome his sorrows, he writes superb pieces. He meets Ludwig van Beethoven, aged 17. Leopold died on May 28. It was a severe shock for Mozart. He would never again see his sister, who had married a baron. Wolfgang continued to write, but he was no longer fashionable. Constance gave birth to a daughter, but the couple lacked money and had numerous debts. A second child was born in 1789. Mozart wrote, 'The Magic Flute'. He was weak and tired; the illness was winning. On December 5, 1791, in Vienna, he died, poor and unknown. His body was thrown in a common grave, without even a cross. Second movement of the Sinfonia Concertante for violin and viola by W.A. Mozart. In this excerpt, the themes are first played by the orchestra, then taken up again by the violin, and later by the viola, where we notice the lower "voice" compared to the violin. Wolfgang Amadeus Mozart in the collection 'The Geniuses of Art', published by Atlas. ↑ A method is a workbook devoted to the study of an instrument. For a long time, 'The Method' by Leopold Mozart was a reference in the study of the violin because it is very comprehensive and detailed. Since then, numerous violinists, artists, and teachers have created other methods for violin. This page was last edited on 21 March 2018, at 15:51.